You might already know what the Pantone Colour is. In fashion and home textile printing we follow a colour standard to match required print colour shade. The standard that is mostly used for colour matching in fashion and home is PANTONE colour matching system. We follow the colour printed on Pantone chips for reference. Most of the apparel buyers give reference to a Pantone colour code (example PANTONE 14–4510 TPX or Aquatic) to follow for print colour matching. The Pantone colour matching book (Cotton swatch library) is costlier and small garment export houses/manufacturers normally don't buy this color matching guide book. When needed buying house and buyer used to send a cutting of Pantone colour chip with colour code number to their suppliers for printing and dyeing colour referene. Merchandisers experienced that it is difficult to share the small cutting of Pantone chip with printers/dyers when needed. At the same they need to keep part of the cutting for their reference. Sometimes they lost the colour chip by mishandling. Many times you may need to ask your buyer to send the colour chip. Now Pantone has added a tool to find Pantone colour online in their website. Now by entering a colour code in the search box, you will get colour standard. 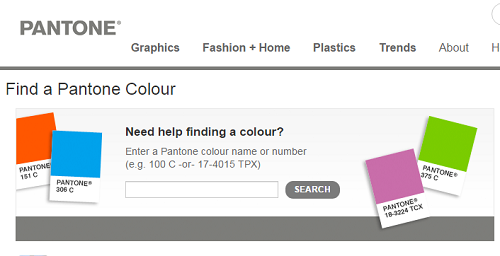 So next time when you need to see what colour a Pantone code means, you can quickly check it by using this search box. Even you can become smart by learning colour code and identifying the colour very easily. Note: While using this search box you should remember that colours shown on this site are computer simulations of the PANTONE colours and may not match PANTONE-identified colour standards. See the following example. I have entered colour code 18-3224 TCX and entered search button. I got following screen, which shows where this colour chip is available and page number and the colour name (Radiant Orchid). 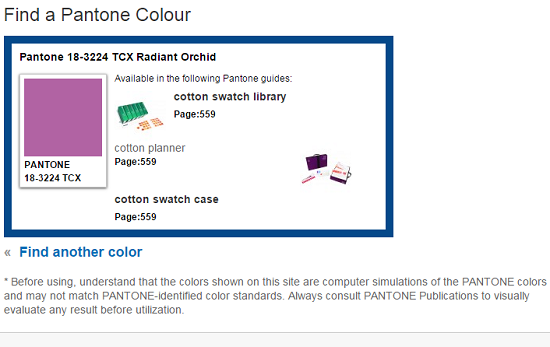 Find Pantone colour reference online by searching with Pantone colour code.